That is an exchange between Alice and the Mad Hatter, and it is also the name of a restaurant that we went to one evening with my Favorite Daughter, her family and two other families as well in Birmingham, Michigan. For any of you that have seen pictures of me over the years will realize that it could be the perfect place for me, on so many levels. After all, I have about thirty-five dress hats between two seasons, so the odds are, I can be seen with a Panama, a Boater, a Bowler, an Evening Hat, a Homburg, a myriad of Fedoras and Trilby’s and I even have a Deer-stalker. 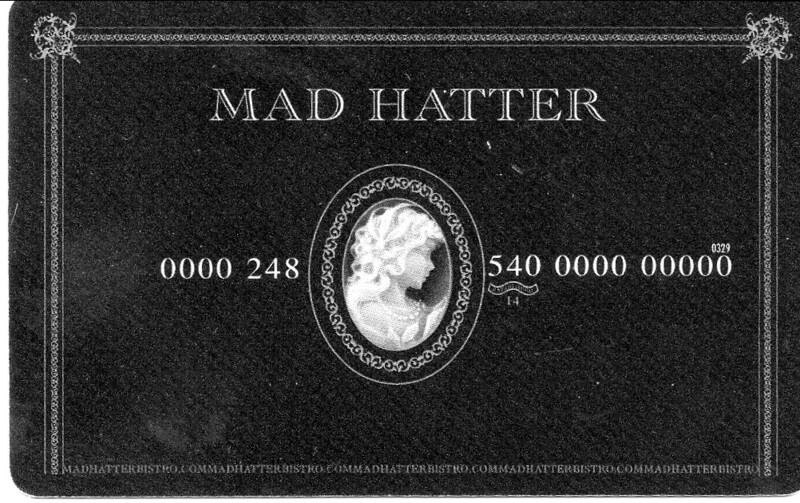 I may be mad as a hatter, and the truth be known, I even know why a hatter is mad; up until the turn of the last century, fine fur hats were cured with Mercury and over the years that element would be absorbed into the system of a hatter, until he was demented from the poison that affected the brain. They no longer use Mercury in the hat making process, and since I am straying all over the place, the reason why ladies secure their hats from a milliner, is because it is a bastardization of the German language using an Italian place name. Hats were made in Milan, and a hat that came from Milan was a Milan-er in German. Oh the arcane knowledge that I have acquired. Getting back to the subject at hand, we were all going to a restaurant called Mad Hatter, and since there was about twenty of us having dinner, they put us in the cellar, and it was made to be reminiscent of the rabbit hole, with grass on the walls and upside down lamps. This cute room is actually used for children’s tea parties in the afternoons, if one books it ahead of time. I also noticed some drawings by Sir John Tenniel, whose famous drawings accompanied the Alice books by Lewis Carroll. We did not have a tea party, but with all the children that evening, we could have. The restaurant had ample selections of appetizers and entrée choices for everyone to choose from, though my Son-In-Law from Las Vegas was disappointed with an eight ounce filet, since everything is quite large in size where he comes from. Otherwise I would say that everyone else was sated, especially the children, who this restaurant was chosen for, but the theme was probably lost on them. While the children were enjoying soft drinks, and most of the adults were either having cocktails or beer, my Bride and I ordered a bottle of wine. As I will change Carroll’s “it’s always tea time” to “it’s always wine time,” because it is much more appropriate to my way of thinking. I chose a bottle of Chateau Ducasse Bordeaux Blanc 2014, as my Bride and I were having chicken and sea food for our dinner. This bottle was a classic white Bordeaux blend of Semillon, Muscadelle and Sauvignon Blanc. This was a nice crisp wine to have on a summer evening; and not only was the wine refreshing, it was refreshing to see a white Bordeaux wine being offered, as it is not seen too often any more in restaurants. 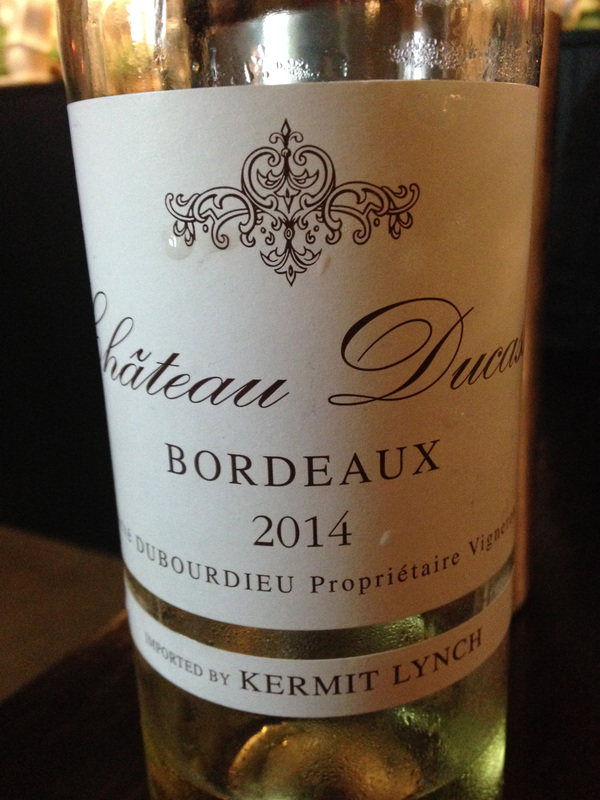 This entry was posted in Dining, Wine and tagged Bordeaux, Chateau Ducasse, France, Muscadelle, Sauvignon Blanc, Semillon. Bookmark the permalink.